...well yes, a bar-restaurant with friendly banter and laughter is also one of the reasons why he simply cannot resist shopping there. 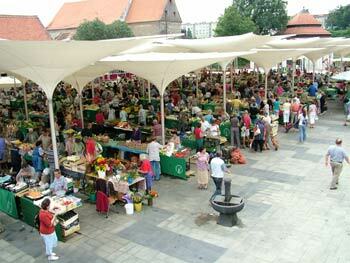 There are 3 regular open markets in Maribor. 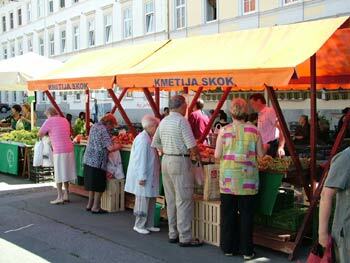 - Small farmers market at the Trg Svobode (Liberty square) every Wednesday in the morning. 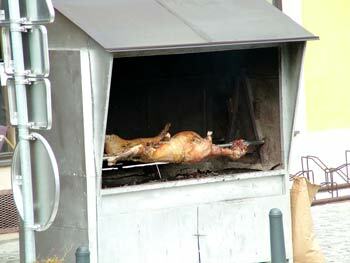 - Organic market at the Glavni trg (Main square) every Friday from 9am to 2pm and Saturday from 8am to 1pm. - The central open market situated just west of the pedestrian zone between River Drava and Koroska cesta (Koroska street). 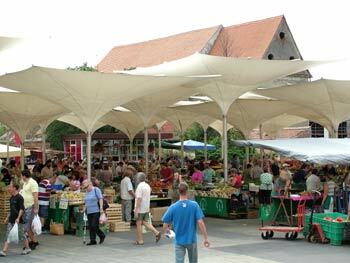 The central open market was recetly completely refurbished and was reopened again at the end of 2008. It offers an even greater choice of local produce, fruits and vegetables. It's a new modern market with a shopping centre and is open from Monday to Sunday: from 6am - 3pm. Farmers market (only locally sourced). often ends in laughter and chatting with local farmers. The central open market is open again. What a relief for many Mariborians. just about everything local farmers can offer. 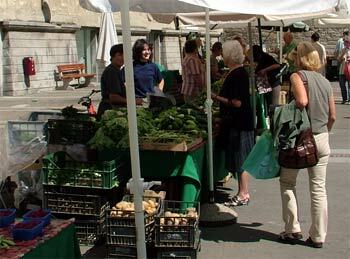 Apart from Farmers markets that are open weekly, other Maribor's open markets are permanent and open every day of the week though best shopping is during weekends (particularly Spring, Summer and Autumn when local farmers can offer abundance of fresh local produce). ...no wonder then he is off to the open market so often! 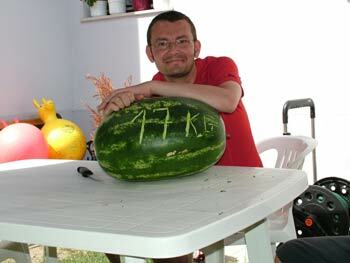 a 17kg (38 pounds) beast water melon. ...not to mention all the fruits and vegetables (just look at the above water melon).